Our major ambition is to address unsolved and persisting challenges in the synthesis of complex organic scaffolds hence allowing preparation of biologically relevant compounds and their analogues. We recently focused on complex pimaranes such as momilactones or neoclerodanes belonging to the salvinorin family, using innovative strategies for the construction of their skeleton. Particular attention is paid to the critical stereoselective installation of their respective quaternary centres. Cyclophanes represented by (+)-myricanol or (M)-isoplagiochin C/D are also targeted, and the challenging atropostereoselective ring closure of their seco-precursors is studied and performed using new methodologies. Medicinal chemistry with the synthesis of selective low molecular weight inhibitors of VEGFR as antiangiogenic products and of CDC25 phosphatases as anti-cancer compounds. Very recently, we designed new antagonists and agonists of the hedgehog pathway for cancer stem cells inhibition and their synthesis is currently underway in our group. Another axis focuses on the preparation of fluorinated analogs of pristinamycin IA to provide better pharmacokinetic parameters of these important antibacterial agents. 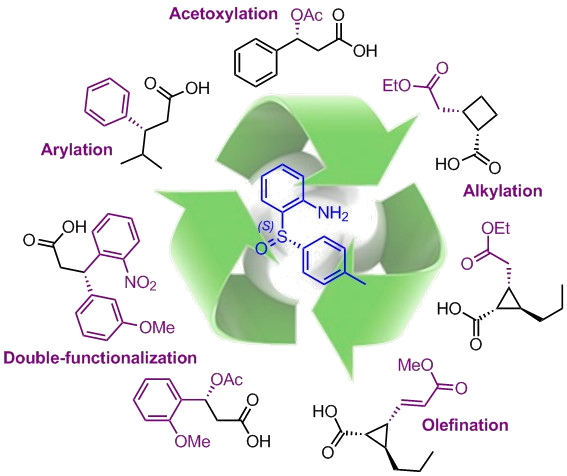 Following an urgent need for more performant and environmetally benign transformations, SynCat team focuses major effors on the development of original synthetic solutions for asymmetric catalysis. The first research axis in this field concerns the metal-catalyzed asymmetric C-H functionalization. 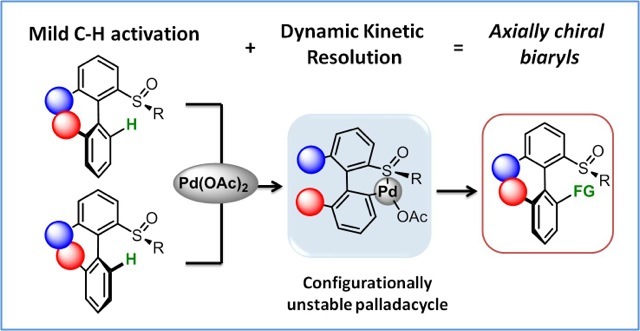 Our work focuses first on the atroposelective C-H functionalization with high yield and diastereoselectivity, affording complex scaffolds, among them natural product precursors. Another part of the work is dedicated to the asymmetric C(sp3)-H functionalization of aliphatic chains using a sulfoxide-based chiral auxiliary. We developed original diastereoselective methods allowing various stereoselective transformations, such as arylation, alkylation, acetoxylation or challenging olefination, in good to excellent total yields. Using our first generation of enantiopure sulfinyl aniline (S)-2-(p-tolylsulfinyl)aniline or APS, valuable chiral carboxylic acid derivatives, among them natural products and known insecticides, can be efficiently synthesized. We also work on challenging asymmetric transformations mediated by a stereogenic hypervalent iodine. 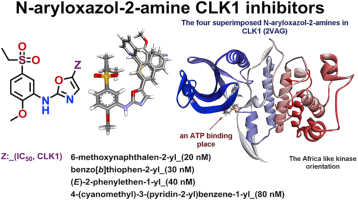 Axially chiral C-N compounds are an emerging but scarcely investigated class of stereogenic molecules with potential applications as biologically active scaffolds and chiral ligands. The synthesis of these compounds is extremely challenging and in particular no metal-catalysed asymmetric, intermolecular C-N coupling has been previously reported. Herein we disclose an intermolecular atropselective C-N coupling, occurring with excellent stereoselectivity. This Cu-catalysed transformation is based on the use of highly active coupling partners, i.e. chiral iodanes bearing a very cheap and traceless sulfoxide auxiliary. Use of such original ortho-sulfoxide iodanes enables this challenging coupling to occur at room temperature, guaranteeing high atroposelectivity and atropostability of the coupling products under reaction conditions. Due to extensive possible post-modifications of the optically pure products, a panel of unprecedented C-N axially chiral scaffolds can now be accessed. 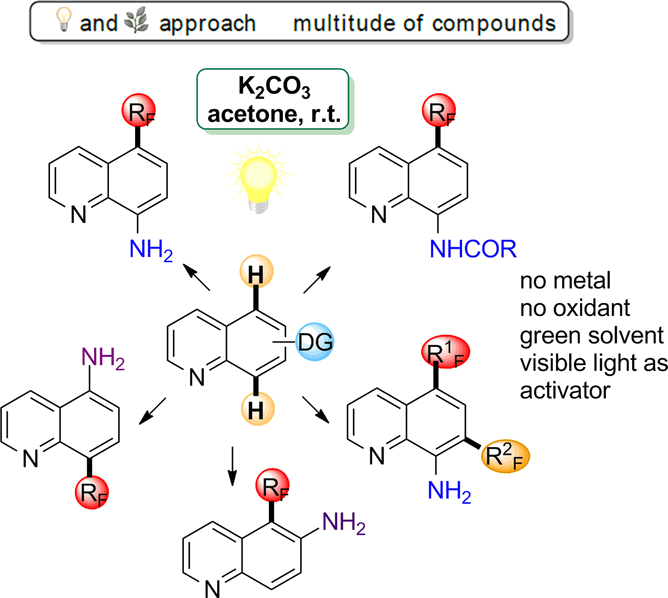 Targeting challenging C-C couplings, a dual catalysis merging C-H activation and visible-light induced photocatalysis is explored; the combination of these two complementary modes of activation of organic molecules, well adapted to each of the coupling partners should allow generation of highly reactive species under mild reaction conditions. Further importance of this reaction relays on its capacity to functionalise selectively both C5 and C8 positions. This coupling tolerates a wild range of directing groups and is compatible with non-protected amino-quinoline substrates, contrary to a majority of literature described protocols. This transformation is also suitable for diversification of more complex quinoline scaffolds and allows introducing a variety of perfluoroalkyls. In addition, it perfectly fulfills green chemistry requirements. Accordingly, this procedure paves the way towards an array of new compounds with promising features for medicinal and agrochemical industry, as well as advanced material science, under truly green, mild and user-friendly reaction conditions.